Fanbyte’s Eric Van Allen played WORLD OF HORROR, the unsettling cosmic horror retro RPG from Panstasz and Ysbryd Games, at PAX South 2019. Eric reports that WORLD OF HORROR is a memorable experience, marked by its creepy, distinct visuals and haunting music. Maybe best described as a narrative roguelike by way of Junji Ito and H.P. Lovecraft, WORLD OF HORROR is all about trying to survive cosmic horrors and sealing away evil before it consumes you. Its gorgeous, lo-fi aesthetic and chilling chiptunes render the various monstrosities in a wonderful light . . . WORLD OF HORROR is one that I can’t wait to get lost in, diving further and further into the abyss. 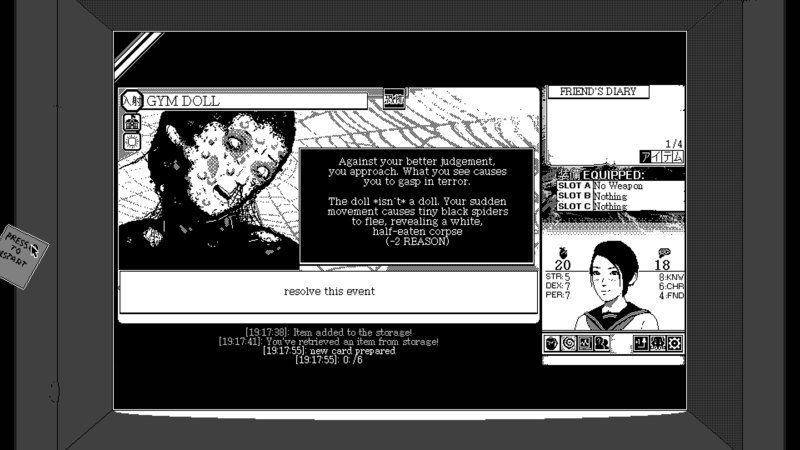 WORLD OF HORROR brings a 1-bit art style, unforgiving choices, and unnerving environments to Nintendo Switch, PlayStation 4, Steam for Windows, Mac and Linux in 2019. Read Fanbyte’s full impressions and learn more about Panstasz and Ysbryd Games. This entry was tagged adventure, adventure game, adventure games, horror, Horror Game, horror games, indie, indie game, indie games, junji ito, Mac, Nintendo Switch, panstasz, PAX South, PC, pc gaming, PlayStation 4, pr, PS4, roguelike, roguelite, RPG, steam, Stride PR, switch, video game, video game pr, video game pr agencies, video game pr agency, video game preview, video games, videogame, world of horror, Ysbryd, Ysbryd Games. Bookmark the permalink.